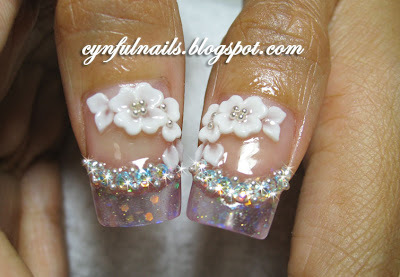 ♥♥♥ this set of bridal nails I did in early Jan very much. Clear pink tips w some holo flakes, with crystals and beads lined in french style. I´m just wondering, how much time it takes to do something this beautiful? Omg,I love your nails! So pretty! I want nails like that for my self too :( My nails are so short..